Crochet EarringsThere are 31 products. Wire crochet earrings from e-shop Unikatnica are unique handmade designer earrings. They are made for women who like gorgeous, different, elegant and fashionable handmade earrings and would want to emphasize their natural beauty. Crochet earrings represent a wonderful handmade gift and they are made of crocheting yarn, wire, wool, while some of them include Swarovski Crystals. These round silver and blue crochet earrings from Unikatnica are beautful and very elegant, also feminine jewelry made of silver and blue crocheting yarn and unique pattern of wire. Important! B efore you purchase this amazing pair of silver and blue crochet earrings, logg in/sign in to Unikatnica. These silver crochet earrings from Unikatnica are beautful and very elegant, also feminine jewelry made of silver crocheting yarn and unique pattern of wire which represents spiral and circle. Important! B efore you purchase this amazing pair of silver crochet earrings, logg in/sign in to Unikatnica. These blue sky crochet earrings from Unikatnica are made of blue sky crocheting yarn and unique pattern of wire. Important! B efore you purchase this amazing pair of blue sky crochet earrings, logg in/sign in to Unikatnica. These teardrop silver crochet earrings from Unikatnica are beautiful and very elegant, also feminine jewelry made of silver crocheting yarn and unique pattern of wire. They will sparkle under the sunlight and attract the looks. Important! 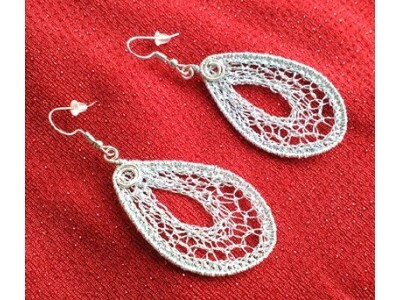 B efore you purchase this amazing pair of teardrop silver crochet earrings, logg in/sign in to Unikatnica. These sky blue crochet earrings from Unikatnica are made of sky blue crocheting yarn and unique pattern of wire. Important! B efore you purchase this amazing pair of sky blue crochet earrings, logg in/sign in to Unikatnica. Beautiful handmade dark violet crocheted earrings are made of dark violet crocheting yarn. These dark violet crocheted earrings make trully an amazing and also unique birthday gift for women. IMPORTANT! Before purchasing these wonderful dark violet crocheted earrings register/log in to Unikatnica.